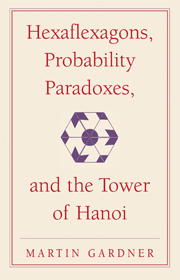 John H. Conway, F. R. S.
Gardner’s first book of mathematical puzzles and games / Martin Gardner. 1. Mathematical recreations. I. Title. II. Series. Martin Gardner thanks Scientific American for allowing reuse of material from his columns in that magazine, material Copyright © 1956 (Chapter 1), and 1957 (Chapters 2–13), and 1958 (Chapters 14–16) by Scientific American, Inc. He also thanks the artists who contributed to the success of these columns and books for allowing reuse of their work: James D. Egelson (via heirs Jan and Nicholas Egleson), Irving Geis (via heir Sandy Geis), Harold Jacobs, Amy Kasai, and Bunji Tagawa (via Donald Garber for the Tagawa Estate). Artists names are cited where these were known. All rights other than use in connection with these materials lie with the original artists. Photograph in Figure 48 is courtesy of the Museum of Fine Arts, Boston, 2008. Used by permission. The element of play, which makes recreational mathematics recreational, may take many forms: a puzzle to be solved, a competitive game, a magic trick, paradox, fallacy, or simply mathematics with any sort of curious or amusing fillip. Are these examples of pure or applied mathematics? It is hard to say. In one sense recreational mathematics is pure mathematics, uncontaminated by utility. In another sense it is applied mathematics, for it meets the universal human need for play. Perhaps this need for play is behind even pure mathematics. There is not much difference between the delight a novice experiences in cracking a clever brain teaser and the delight a mathematician experiences in mastering a more advanced problem. Both look on beauty bare – that clean, sharply defined, mysterious, entrancing order that underlies all structure. It is not surprising, therefore, that it is often difficult to distinguish pure from recreational mathematics. The four-color map theorem, for example, is an important theorem in topology, yet discussions of the theorem will be found in many recreational volumes. No one can deny that paper flexagons, the subject of this book's opening chapter, are enormously entertaining toys; yet an analysis of their structure takes one quickly into advanced group theory, and articles on flexagons have appeared in technical mathematical journals. Creative mathematicians are seldom ashamed of their interest in recreational mathematics. Topology had its origin in Euler's analysis of a puzzle about crossing bridges. Leibniz devoted considerable time to the study of a peg-jumping puzzle that recently enjoyed its latest revival under the trade name of Test Your High-Q. David Hilbert, the great German mathematician, proved one of the basic theorems in the field of dissection puzzles. Alan Turing, a pioneer in modern computer theory, discussed Sam Loyd's 15-puzzle (here described in Chapter 9) in an article on solvable and unsolvable problems. I have been told by Piet Hein (whose game of Hex is the subject of Chapter 8) that when he visited Albert Einstein he found a section of Einstein's bookshelf devoted to books on recreational mathematics. The interest of those great minds in mathematical play is not hard to understand, for the creative thought bestowed on such trivial topics is of a piece with the type of thinking that leads to mathematical and scientific discovery. What is mathematics, after all, except the solving of puzzles? And what is science if it is not a systematic effort to get better and better answers to puzzles posed by nature? The pedagogic value of recreational mathematics is now widely recognized. One finds an increasing emphasis on it in magazines published for mathematics teachers, and in the newer textbooks, especially those written from the “modern” point of view. Introduction to Finite Mathematics, for example, by J. G. Kemeny, J. Laurie Snell, and Gerald L. Thompson, is livened by much recreational material. These items hook a student's interest as little else can. The high school mathematics teacher who reprimands two students for playing a surreptitious game of ticktacktoe instead of listening to the lecture might well pause and ask: “Is this game more interesting mathematically to these students than what I am telling them?” In fact, a classroom discussion of ticktacktoe is not a bad introduction to several branches of modern mathematics. In an article on “The Psychology of Puzzle Crazes” (Nineteenth Century Magazine, December 1926) the great English puzzlist Henry Ernest Dudeney made two complaints. The literature of recreational mathematics, he said, is enormously repetitious, and the lack of an adequate bibliography forces enthusiasts to waste time in devising problems that have been devised long before. I am happy to report that the need for such a bibliography has at last been met. Professor William L. Schaaf, of Brooklyn College, compiled an excellent four-volume bibliography, titled Recreational Mathematics, which can be obtained from the National Council of Teachers of Mathematics. As to Dudeney's other complaint, I fear that it still applies to current books in the field, including this one, but I think readers will discover here more than the usual portion of fresh material that has not previously found its way between book covers.